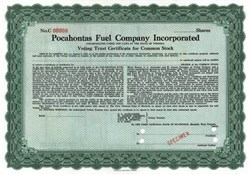 Beautifully engraved SPECIMEN certificate from the Pocahontas Fuel Company Incorporated. This historic document was printed by the American Banknote Company in 1937 and has an ornate border around it. West Virginia's southern coal fields were not opened until about 1870, though they were known to exist much earlier. One of the major southern coal fields was the Flat Top-Pocahontas Field, located primarily in Mercer and McDowell counties. The Flat Top Field first shipped coal in 1883 and grew quickly from that time. Operations were consolidated into large companies, and Pocahontas Fuel Company, organized in 1907, soon dominated the other companies in McDowell County.